The Koch brothers -- David and Charles -- are the right-wing billionaire co-owners of Koch Industries. As two of the richest people in the world, they are key funders of the right-wing infrastructure, including the American Legislative Exchange Council (ALEC) and the State Policy Network (SPN). In SourceWatch, key articles on the Kochs include: Koch Brothers, Koch Industries, Americans for Prosperity, American Encore, and Freedom Partners. 3.1 Recent ALEC "Model" Bills on Guns"
The NRA spent at least $24.28 million this past election cycle - $16.83 million through its Political Action Committee, plus $7.45 million through its affiliated Institute for Legislative Action. A minuscule 0.81 percent of the NRA's Political Victory Fund money went towards elections where the NRA's preferred candidate won. The NRA Institute for Legislative Action fared better, with a 10.25 percent return on their investment. 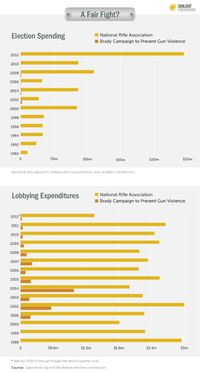 The Sunlight Foundation reports that the NRA spends 66 times what the leading pro-gun control advocacy organization, the Brady Campaign to Prevent Gun Violence, spends on lobbying, and 4,143 times what the Brady Campaign spends on elections. They note this with the caveat that the NRA does a poor job accurately reporting its spending. The NRA is a long-time member and longtime funder of the American Legislative Exchange Council (ALEC), and an NRA representative has served on the Public Safety and Elections Task Force, and its predecessor Crime Committees, for many years. ."
Tara Mica, NRA-Institute for Legislative Action State Liaison, was the co-chair of ALEC's Public Safety and Elections Task Force from 2008 until the Spring of 2011. (formerly known as the Criminal Justice and Homeland Security). While the NRA was co-chair, that Task Force approved the controversial "voter ID" bill and the Arizona anti-immigrant legislation, SB 1070, as model bills, in addition to other gun laws. "Some of the things that we were pushing in states was the 'Castle Doctrine,' we worked with the NRA on that. That's one of our model bills we have states introduce and another one was the Emergency Powers legislation, which was enacted in a couple states, including some liberal states that normally don't give us anything. Like California, for example, where now you have on the law there where the governor can't come in and take your guns in an emergency, like we saw in Louisiana and some other states." * ALEC's legal argument on guns can be found here. * The library of NRA/ALEC gun bills can be accessed here. The Center for Media & Democracy's infographic (PDF) shows some of the connections between the NRA, ALEC, and the effect of the ALEC/NRA Shoot First law. Recent ALEC "Model" Bills on Guns"
The retail sale of machine guns has been barred by federal law since the gangster era but, as uncovered by the Center for Media and Democracy (CMD), one year ago at ALEC's "policy summit" in Arizona, the NRA obtained unanimous support from the corporate and lawmaker members of ALEC's Task Force for "amending" ALEC's "Consistency in Firearms Regulation Act" to expressly bar cities from banning "machine guns." Other provisions of that bill prevent cities from banning armor-piercing bullets and from banning efforts to alter guns to make them more deadly if the state does not do so. It also bars cities from suing gun manufacturers for gun deaths based on the theory of liability used by governments to sue tobacco manufacturers for smoking deaths. In 2008, as noted by CMD, in the aftermath of the tragic massacre of students and professors by a heavily armed Virginia Tech student, ALEC adopted a model bill to remove state prohibitions of guns on college campuses and to allow students to bring guns to class. Also in 2008, as CMD has documented ALEC also weighed in on litigation challenging a handgun ban in the city of Chicago. ALEC filed a brief with the U.S. Supreme Court in that case, McDonald v. Chicago, on the same side as the NRA. In 2005,at an ALEC task force meeting co-chaired by Walmart, corporate lobbyists and politicians voted to approve the NRA's request that a law it spearheaded in Florida with ALEC members become a "model" for other states. That ALEC bill was misleadingly named the "Castle Doctrine," but is also known as the "Stand Your Ground" or "Shoot First" or "Kill at Will" law. That Florida law, was initially invoked by law enforcement to prevent the arrest and prosecution earlier this year of high-school student Trayvon Martin's killer. The law creates legal immunity for shooters claiming self-defense, going well beyond the reach of the traditional rights of self defense to create what some call a "license to kill." CMD connected those dots and documented that the NRA's lobbyist Marion Hammer pushed this bill through the Florida legislature in early 2005. She then brought the law to the closed door ALEC task force meeting in Texas that summer to become a priority for ALEC legislators. According to the NRA at that time, her pitch was warmly received and "unanimously" adopted by the private and public sector members at that meeting. The list of special interest reps attending that meeting is not publicly available, but it is known that the nation's largest retailer of ammunition and long guns, Walmart, was the corporate leader of that task force; earlier this year, Walmart announced it was resigning from ALEC. Also around that time, ALEC pushed a variety of legislation to require reciprocity between states for "concealed carry" laws, laws that result in more people carrying concealed firearms in public places, as CMD has noted. In 2000, as CMD has reported, when Koch Industries was the chair of ALEC's corporate board, ALEC's crime task force adopted the "Defense of Free Market and Public Safety Resolution" as a national template for states across the country. That resolution was an effort to thwart law enforcement from using contracts -- to buy firearms for police officers -- to favor gun manufacturers that adhered to a code of conduct. As part of a lawsuit settlement, gun manufacturer Smith & Wesson (S&W) had agreed to penalize S&W retailers who sold guns that tended to end up used in crimes, barred S&W retailers from using the gun show loophole to avoid conducting criminal background checks on prospective buyers, and forbade dealers from releasing more than one handgun to a purchaser per day. It also required retailers to sell all of its handguns with mechanical trigger locks to help protect kids from accidentally killing themselves or others. ALEC's resolution sought to bar states from rewarding S&W with contracts for police weapons or creating an incentive for other gun manufacturers to adopt similar voluntary codes of conduct. In 1995, ALEC promoted as model legislation a bill that would create state-based criminal background checks for firearms purchases different from the federal Brady Handgun Violence Prevention Act, which established the National Instant Check criminal background check system at the FBI. As analyzed by CMD, ALEC's bill expressly exempts firearms sales at gun shows from its background checks (creating a "gun show loophole"). It also exempts holders of "concealed carry" permits from a background check, even though the Brady Law attempts to protect the public through background checks regardless of whether a person had previously obtained a permit to carry a gun, such as from people who subsequently become fugitives or persons adjudicated to be mentally unstable. As CMD has shown, ALEC also strongly opposed the 1994 "Assault Weapons Ban," which sought to expand the long-standing federal bar on fully automatic machine guns by preventing the purchase of rapid-firing "semi-automatic" assault-style weapons. Certain military-style firearms -- such as the .223 Bushmaster rifle reportedly found at the scene of the Connecticut school massacre and similar to the one used in the sniper shootings that terrorized D.C. in 2003 -- include versions for sale in the U.S. that were modified by manufacturers for the civilian market along with versions that allow three-shot bursts of fire with each pull of the trigger for law enforcement rather than their faster-firing military-style kin like an M4 or AK-47, in light of the federal assault weapons ban. The ban was allowed to expire during the George W. Bush administration, which had very close ties to the NRA. ALEC also strongly opposed the 1994 "Assault Weapons Ban," which sought to prevent the U.S. sale of semi-automatic weapons, similar to the notorious AK-47 -- a rapid-fire style weapon that has been used in numerous mass murders in the U.S. That ban has since expired. ALEC also filed papers with the courts calling for city bans on guns to be struck down as unconstitutional. ALEC's move in January, 2012 to urge state legislators to prevent city officials from limiting access to machine guns comes in the wake of an earlier decision by new justices on the U.S. Supreme Court who struck down D.C.'s gun ban, in part at ALEC's request. The total amount the NRA has paid in membership dues to ALEC is unknown. In addition to annual fees, the NRA can pay a premium to be featured as a co-sponsor of ALEC meetings. For example, at last year's annual ALEC convention, the NRA was a "Vice-Chairman" level sponsor of 2011 American Legislative Exchange Council Annual Conference, which in 2010, equated to $25,000. In the 2010 federal congressional elections, the NRA contributed $902,700 to Republican candidates and gave $373,350 to Democratic candidates. A national poll commissioned by the bipartisan group Mayors Against Illegal Guns was conducted by Frank Luntz in May, 2012. It found a great deal of common ground in the U.S. between gun-rights advocates and gun-control advocates. The outlier in these policies is the NRA's leadership. The poll found 87 percent of NRA members agree that support for Second Amendment rights goes hand-in-hand with keeping guns out of the hands of criminals. 74 percent of NRA members and 87 percent of non-NRA gun owners support requiring criminal background checks of anyone purchasing a gun. 79 percent of NRA members and 80 percent of non-NRA gun owners support requiring gun retailers to perform background checks on all employees – a measure recently endorsed by the National Shooting Sports Foundation, the trade association for the firearms industry. NRA members strongly support allowing states to set basic eligibility requirements for people who want to carry concealed, loaded guns in public places, with 91 percent of NRA members stating states should decide. By contrast, the NRA leadership’s top Federal legislative priority – national reciprocity for concealed carry permits – would effectively eliminate these requirements by forcing every state to allow non-residents to carry concealed guns even if they would not qualify for a local permit. 75 percent of NRA members believe concealed carry permits should only be granted to applicants who have not committed any violent misdemeanors, including assault. 74 percent of NRA members believe permits should only be granted to applicants who have completed gun safety training. 68 percent of NRA members believe permits should only be granted to applicants who do not have prior arrests for domestic violence. 63 percent of NRA members believe permits should only be granted to applicants 21 years of age or older. The NRA rank and file also supports barring people on terror watch lists from buying guns (71 percent) and believe the law should require gun owners to alert police to lost and stolen guns (64 percent). The NRA’s Washington office strongly opposes both measures. Another national poll commissioned by Mayors Against Illegal Guns was conducted by Frank Luntz's firm, The Word Doctors, in 2010. It found the vast majority of gun owners not only believe that law-abiding Americans have the right to own guns, but they also believe that government ought to be doing more to keep guns out of the hands of criminals. The poll's respondents indicated 69 percent of NRA members and 86 percent of non-NRA gun-owners support closing the "gun show loophole." The loophole allows some vendors at gun shows to sell guns without conducting the federal background checks that all licensed gun dealers perform. Gun shows provide hunters, collectors, sportsmen and gun enthusiasts with a place to shop - but as the Department of Justice has reported, 30 percent of guns in illegal gun-trafficking cases are linked to gun shows. The poll also found support among NRA members and other gun owners for numerous other policies to strengthen safety, security and law enforcement, including allowing the FBI to block gun sales to individuals on the terror watch list, requiring gun owners to report lost and stolen guns to police and providing local police departments with more data analysis of gun trafficking patterns. In June 2004, the NRA revealed that it would commence broadcasting NRANews, a three hour daily program. Identify large, influential groups concerned with freedom of expression and other Constitutional "rights" (e. g. the National Rifle Association and the Second Amendment, groups opposed to polygraph tests and the Fifth Amendment,minority groups and the 14th Amendment, etc.) and encourage their support for consistent and fair application of Constitutional protection for legal products and practices. Sharon Theimer, "Gun Lobby Looking to Buy Media Outlet", Associated Press, December 7, 2003. Eric Mink, Target audience, St. Louis Post-Dispatch, December 10, 2003. Douglas Quenqua, "NRA vows to reveal Dems posing as gun supporters," PR Week, March 1, 2004. Mark Hand, "NRA courts controversy in push to amplify message," PR Week, September 19, 2005, p. 12 (not available online). Thalif Deen, "U.S. Gun Lobby Blasts U.N. Arms Meet", InterPress Service, June 21, 2006. ↑ 1.0 1.1 "A Brief History of the NRA", National Rifle Association website, accessed July 9, 2011. ↑ Richard Feldman, Ricochet:Confessions of a Gun Lobbyist (excerpt),available at "Google Books," accessed July 9, 2011. ↑ Ron Williams, District 39 State Representative Jeff Smith Garners NRA Endorsement (noting Tara Reilly Mica's title), June 17, 2011, Columbus Packet, accessed July 9, 2011. ↑ Tara Mica bio, ALEC website, accessed July 9, 2011. ↑ Randall G. Shelden, Research Brief: American Legislative Exchange Council, Center on Juvenile and Criminal Justice, April 2011, accessed July 9, 2011. ↑ Criminal Justice and Homeland Security Task Force, ALEC website, accessed July 9, 2011. ↑ NRA News, CPAC 2008: Michael Huff of the American Legislative Exchange Council, NRANews.com, accessed July 9, 2011. ↑ Center for Responsive Politics, NRA Summary, OpenSecrets.Org, accessed July 9, 2011. ↑ National Rifle Association Recipients,"Open Secrets.org"
↑ Richard Dreyfuss, Political Snipers, American Prospect, Sept 21, 1995, accessed July 9, 2011. ↑ AP, In Gun Lobby's Pocket, CBS News, Feb 11, 1999, accessed July 9, 2011. ↑ 32.0 32.1 AP, NRA Looks to Buy Media Outlet, be Exempt from Election Rules, USA Today, Dec. 6, 2003, accessed July 9, 2011. This page was last edited on 12 October 2017, at 18:09.